Stan Flack is the Director of Construction at The Sembler Company, where he has worked for more than 20 years. He supervises every aspect of construction on Sembler development and redevelopment projects, ensuring every job meets rigorous quality, cost and schedule requirements. In his more than two decades with Sembler, Flack has overseen some of the company’s largest projects to date, including construction of the one-million-plus square-foot Winter Garden Village project near Orlando, FL. 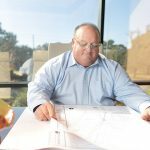 He runs projects in the company’s entire footprint throughout the southeastern U.S.
Flack is a graduate of Michigan Technological University, where he earned a Bachelor of Science degree in Geological Engineering.